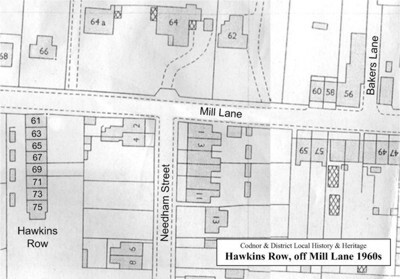 Hawkins Row consists of eight cottages built sometime between 1850 and 1880 and is located at the top of Mill lane just past Needham Street. It gets its name from Israel Hawkins who was a farmer and Coal Merchant from Golden Valley. He purchased the terraced cottages in the 1870s. Israel transported coal on the Cromford Canal using his own barge, he died in 1915 and the ownership of the cottages passed on to his children. James Trivett (Labourer) and his wife Mary and grandson Thomas Draycott. Henry Holbrook (Stonemason) and his wife Mary, son Thomas and daughters; Harriett and Elizabeth. Christopher Wright (Coal Miner) and his wife Alice, son William and daughter Mary. Also staying at the house was Christopher’s brother John Wright (Coal Miner) and his wife Alice and their son Elijah. Chris Wright (Coal Miner) and his wife Mary and daughter Elizabeth. Mary Allen (Windower) sons John, Edward and Stephen. Daughters Elizabeth (Domestic Servant) and Mary. Joseph Cresswell (Coal Miner) and his wife Phoebe. Sons Joseph W and William and daughter Mary. John Lawson (Coal Miner) and his wife Lucy, son William and daughter Lucy E.